Phenology is an excellent lens for teaching about the natural world. Nature's Notebook offers place-based, hands-on learning opportunities and promotes collaboration between site-based educators, land-managers, and researchers. If you are an educator, consider partnering with a local program seeking long-term phenology information on species of interest in your area. Many organizations are collecting data about the natural world and Nature's Notebook can enhance the understanding of species response to a changing climate. If you cannot locate a local program, consider what questions about seasonal and long-term change you might answer with your students or volunteers and create your own study. Data collected by Nature's Notebook observers is available to those interested and helps to validate cutting-edge models designed to map change. 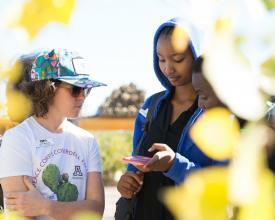 Sabrina Carlson, Arizona Trail Association Seeds of Stewardship - Sabrina works with local schools to create Nature's Notebook monitoring locations where participation enhances student understanding of math, science, language arts, and outdoor skills. These experiences provide youth with repeated opportunities to make observations in nature and help them to see science in action in the field. Lisa Parce, Maynooth University, Adult & Community Education - Lisa has designed a university-level course using Nature's Notebook as a service learning project. For 6 to 8 weeks each semester students contribute observations using a select campus monitoring location. They learn a great deal about the value of repeated visits to the garden, paying close attention, and their contributions to the understanding of local seasonal change. This project is a success because it has spanned multiple years and students are able to compare their observations to others. Moreover, almost everyone reports learning a great deal about the plants they are observing and the value of taking time to slow down. Suzanne Mrozak, Arnold Arboretum Tree Spotter Citizen Science Program - Suzanne, the volunteer, volunteer coordinator of the Tree Spotter program facilitates the monitoring schedule of the group of regular participants. Through workshops, volunteer gatherings, social media engagement, and phenology education Suzanne ensures that there are year-round data collected for the Arboretum's scientists and staff to use to better understand the effects of a changing climate on plants. Esperanza Stancioff and Beth Bisson, Signs of the Seasons: A New England Phenology Program - Operated in partnership by the University of Maine Cooperative Extension and Maine Sea Grant the Signs of the Season (SoS) Program helps document the local effects of global climate change. Esperanza and Beth recruit, train, and provide continuing education to hundreds of backyard observers and participants at local partnering sites. Collected data are used by collaborating scientists and resource managers.